"These always look so pretty on the cookie plates I give for Christmas." In a large bowl, cream together the butter, sugar, and cream cheese until smooth. Beat in the eggs one at a time, then stir in the lemon juice and lemon zest. Combine the flour and baking powder; stir into the cream cheese mixture until just combined. Cover, and chill until firm, about 1 hour. Preheat oven to 350 degrees F (175 degrees C). Roll tablespoonfuls of dough into balls, and place them 2 inches apart on ungreased cookie sheets. 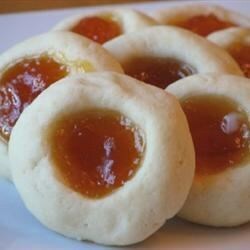 Using your finger, make an indention in the center of each ball, and fill with 1/2 teaspoon of apricot preserves. Bake for 15 minutes in the preheated oven, or until edges are golden. Allow cookies to cool on the baking sheets for 2 minutes before removing to wire racks to cool completely. Sprinkle with confectioner's sugar. Okay recipe. Would add more flour and extra vanilla if I made it again. Very tasty and easy to make. Next time I'll line my cookie sheet with aluminum foil - baked-on jam is hard to clean off!